Open is as open does. Open content has been a hot topic in heritage for several years. The Netherlands Institute for Sound and Vision has long been a front runner when it comes to supporting open standards and free re-use of our collections. Surprisingly enough, we never tried it the other way around: using open content to create an exhibit. So when we started to develop an exhibition celebrating the 50th anniversary of 3FM - one of Holland’s main public pop radio channels - we asked ourselves: would we be able to create a personalized, interactive videomapping exhibit using mainly open content? During a How-To-Session Karen Drost and Maarten Brinkerink will dive into how we managed this, and share what we learned. In 2015, the Dutch public radio station 3FM celebrated its fiftieth anniversary. The first broadcast of the station—then still called Hilversum 3—took place on October 11, 1965. From the start, the station focussed on pop and rock music, later supplemented with electronic, house, and dance music. The Netherlands Institute for Sound and Vision chose to celebrate this anniversary with a dedicated temporary exhibition, 3FM presents: Your Serious Radio. Its focus: the influence of music and radio in your teenage years. The exhibition showcases DJs from all eras of 3FM, featuring hits and radio jingles from the 1960s to present day, and lets visitors experience what it’s like to produce a radio show. When visitors enter the exhibition, they can provide information that builds up their personal profile: year of birth, gender, and favourite radio show, song, and musical genre from their teens. This data is paired with the RFID-chipped ring that Sound and Vision uses throughout its entire museum. So, using its basic infrastructure for the 3FM exhibition was a logical thing to do. We changed a few of the personalisation questions to fit the exhibition and were ready to go. 2. About the RFID ring: How does it work? Figure 1: the RFID ring in use at Sound and Vision since 2006. The ring has been an integral part of the Sound and Vision Experience since its opening in 2006, and has never lost its shine as a key element of our “heads up” visitor experience. 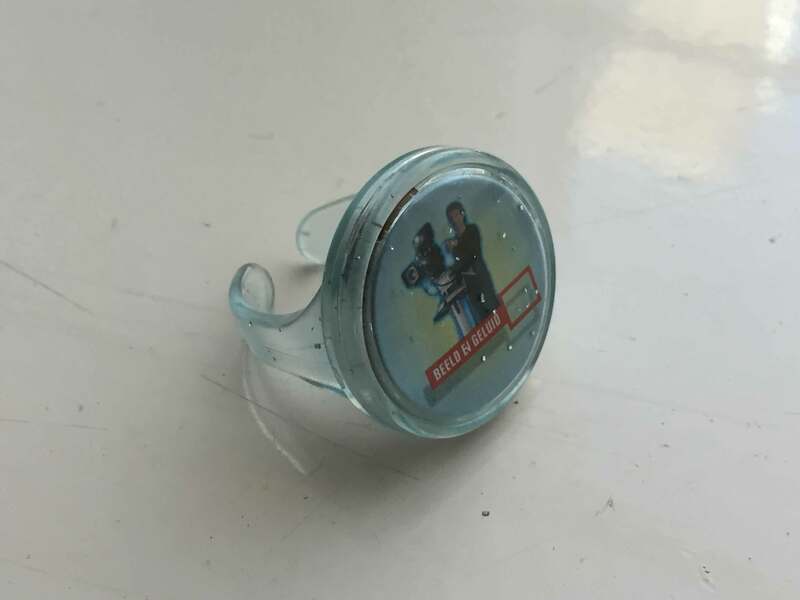 It is equipped with a simple RFID tag, and each regular visitor receives a ring when they arrive. The ring lets visitors use all interactive pavilions in the Experience and save their creations, such as their performance as TV news anchor or DJ, or their part in a Crime series (their task: chase the bad guys in a car). It also asks for a few key pieces of information (e.g., their email and age) and lets them choose a personal (and famous) guide. The ring is used well: 78% of the visitors that receive one use it to create one or more results. 62% of these ring bearers also find their way to our post-visit website to watch, share, or retrieve their results. The RFID ring’s user profile is used extensively for one of the key interactives of Your Serious Radio: a videomapping installation of a teenage bedroom. The installation consists of a sparse white space split into a sitting and sleeping area filled with twenty-five different elements (also white): a bed, desk, couch, rug, radio, television, bookshelves, and many more. 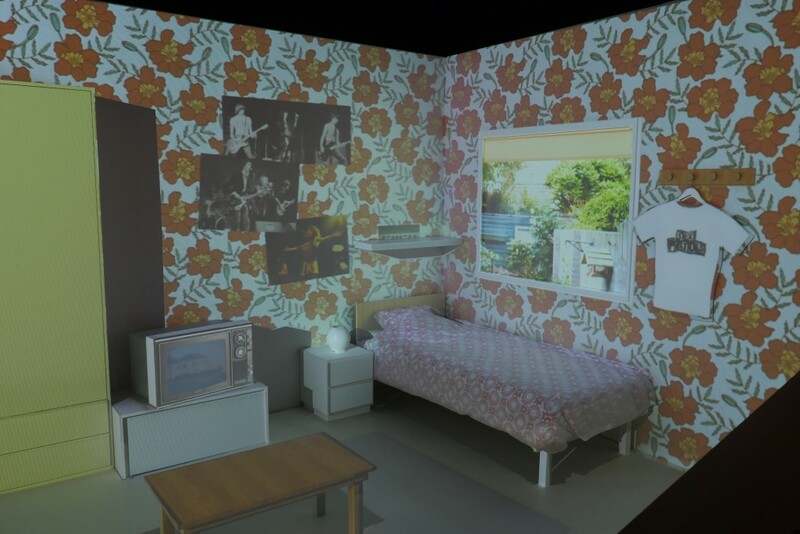 When a visitor activates his or her personal profile with the ring, personalised imagery is projected onto the entire room and its objects: period-correct wallpaper, posters from the user’s favourite artists of the time, “sweet sixteen” t-shirt designs, historical television, and radio fragments. Figure 2: teenage bedroom mapped out for female punk fans born between 1975 and 1979. Figure 3: teenage bedroom mapped out for young male glam-rock fans born between 1970 and 1974. Together they transform the generic room into a personalised room. To enable this level of personalisation, we needed a wide array of images: artists and bands to project on the wall as posters, book covers, a window view (because everyone wants a room with a view). We also needed so-called “seamless” or “tileable” patterns for the interior elements, like the couch, floor, and wall. 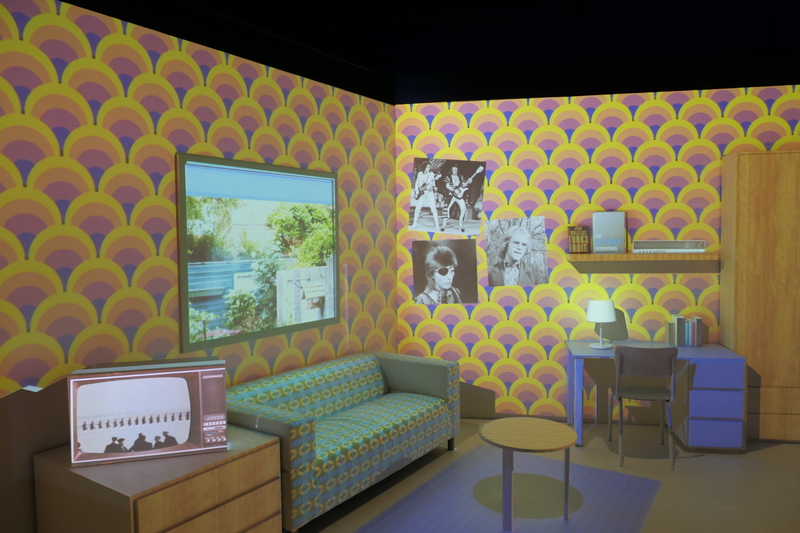 All these elements are created in a 3D virtual world, and depending on the visitor’s information, the seamless patterns are projected and repeated on each of these elements. To create this personalised visitor experience, we mapped the personalisation questions to time segments. We decided to divide the fifty-year period (1965 to 2015) covered by the exhibition into ten five-year segments: 1965 to 1969, 1970 to 1974, and so forth. The profiling software then sorts visitors into these segments by calculating when they were sixteen years old based on their year of birth. Together with their gender and general musical preferences, this provides enough granularity to curate a personalised and recognisable teenage bedroom. To keep things manageable, we scaled back the number of musical genres per time period from the preferred eight to a minimum of four. Quick calculations showed using eight genres per segment would require researching tens of thousands of images, instead of hundreds. This was especially important for us if we wanted to have a fighting chance to complete our mission: use open content for all of it. But even with these limitations, this still posed a sizable challenge. Searching for and using open content provided by others for our museum exhibitions was not a common practice by any means. So initially we had a lot of questions and even reservations about the feasibility of our mission. Is there enough quality open content out there? How do we find it? What are optimal search strategies? And how do we provide correct attribution? Do all Creative Commons licenses allow us to use them for our videomapping? How can we know for sure that what we find is indeed published by or with permission of the rights holder? Wikimedia Commons: All content on Wikimedia Commons has an open license limited only to attribution and share-alike requirements, or is in the public domain. 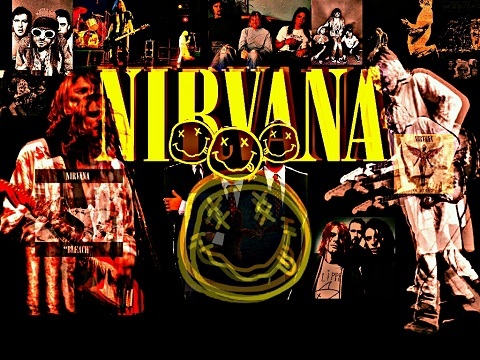 This proved to be an important source, in particular for pictures of bands and musicians. Flickr: Many photographers, designers, and other image creators open up their content under an open license on Flickr. The platform has an easy search filter for open content. The National Archives of the Netherlands: The Dutch National Archives has an amazing and vast collection of openly licensed pictures (CC BY-SA, over four hundred thousand images). Google Image Search: The Search Tools in Google Image Search has a “Labeled for reuse” filter. Since Google also searches in Wikimedia Commons and Flickr, this was often the first resource consulted. But sometimes going directly to websites allows you to break out of the Google “filter bubble” and find more results. The Doornroosje poster archive: The Regional Archives of Nijmegen (NL) have released the poster collection of their music venue Doornroosje on Flickr. Since we needed a lot of music-related posters, this was a great—and fun—source for us. Pixabay and Creative Commons Search: Later on, we found the open stock-image site Pixabay (all content CC0, meaning “No Rights Reserved”) and Creative Commons Search to be indispensable sources as well. The latter is valuable, since it is an easy search entry point to Europeana, with its millions of open content resources that as of yet do not pop up in Google Images Search. Is there enough suitable content available (and what about the quality)? Even though there are plenty of sources available (and we haven’t even mentioned The Internet Archive, Open Culture, or any open sounds databases, such as UBUWeb or Freesound), we still weren’t overly confident of finding enough quality material for our mission. This problem was further compounded by our need to find seamless images, mentioned earlier. But some quick searches (e.g., “retro pattern,” “1980s texture”) on Wikimedia Commons and Flickr yielded enough results to feel confident enough to plunge in. Which licenses support reuse within museum exhibits, and which do not? Sound and Vision is a non-profit organisation, but does receive revenue through tickets sales of the exhibition in which we were going to use the content. Thus, we are not a “non-commercial” entity per se. However, a very important distinction we found in the resources above, and in the language of NC licenses, is that our use is not “primarily intended for or directed towards commercial advantage or private monetary compensation.” This made us confident that our intended use was within the scope of any NC license. Furthermore, we decided to notify all creators of whom we would use content about our project. If they would object, we would replace the image with another one. What if open content is suspect? Figure 4: example of a compilation of works by various creators, uploaded by a user on Deviant Art under a CC BY-ND license. The user does not have the copyright of the remixed images, and can thus not use any of the Creative Commons licenses. First of all, we simply decided not to use these files. Second, we did our part for the community. If the image was found on Wikimedia Commons, for instance, the “suspicious” content was flagged for deletion. This means that the Wikimedia community can decide whether this flagging is indeed correct and proceed to delete the file in question. Figure 5: example of a file flagged by Sound and Vision staff, since deleted by the Wikimedia community. In other cases, people did use a Creative Commons license for content they made themselves, but indicated in the description that they would prefer it if people did not reuse their image without asking them. We decided to exclude this group as well, in order to keep exceptions to a minimum. Another important part of participating in the “open movement” is attribution. All six Creative Commons licenses require it. But since we were going to use hundreds of images, we could not attribute every image in the physical exhibition without severely impacting the experience as a whole. We decided to point to a URL in the physical exhibition colophon that allowed museum visitors to open an extensive online colophon, with a link to a Google Spreadsheet with an overview of all content used. By doing so, we felt very comfortable that we were honouring the providers and creators of the open content as best we could. The final step in the process was contacting the people whose open content we used for the projection—not just to thank them, but also to send them pictures of how their content looks in the final result. Curious yourself? You can find all the pictures of all the rooms here. In the end, we used 254 individual textures, patterns, and pictures, 44% of which are explicitly openly licensed with one of the six Creative Commons licenses. 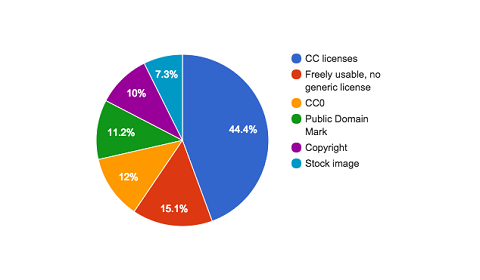 Almost a quarter of the textures are in the Public Domain (11% have the Public Domain-mark, 12% are labeled CC0). 15% of the content is freely usable, but does not have a generic, worldwide acknowledged open license—like Creative Commons. Examples include images of which the creator/owner/user explicitly stated that anyone is free to use their content as they please, or use of a website-specific license as part of a site’s Terms and Conditions (look at these terms from CG Textures for example). Figure 6: overview of division of rights status of content used in videomapping. Well over 80% of the individual content we used was indeed freely usable. The rest is part stock material (7%) or copyrighted material (10%), either from Sound and Vision’s own collection, or for which we obtained direct usage permission of the rights holders or through collective rights organisation Pictoright. We are very happy that we managed to find this much highly specific and quality content that is freely usable. We feel we have managed to demonstrate—to ourselves and the outside world—that open licenses are working as a tool for stimulating creative reuse on a professional level. Mind you, we did pay a few hundred euros for licensing and swapped spending money on commercial licenses for content with spending man hours, but the end result is an exhibit that is striking and also very popular among our visitors. So: Mission accomplished! But that leaves one question unanswered: can we implement this presentation tool for future use? Yes, we can—provided, of course, that there is manpower available to do the leg work. Also important: do a proper scan of the available material beforehand. Because yes, we did find enough usable material in the categories of wallpaper and music, but there is no way of knowing if that is true for all other possible subjects.
. "Open is as open does. How to use open content in a personalized interactive museum exhibit." MW2016: Museums and the Web 2016. Published January 28, 2016. Consulted .